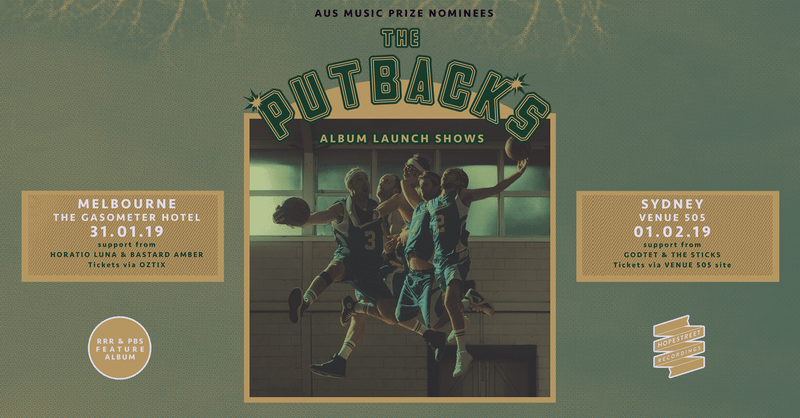 The Putbacks, Melbourne’s heaviest funk rhythm section, are hitting the road to celebrate their debut self-titled album. RRR & PBS Feature album and Australian Music Prize nominee, it’s an album of crunchy post-soul post-jazz mystery-cinema instrumentals for your turntable and your sampler. The Putbacks live show is raw, gritty and electric. They’re a rhythm section that doesn’t need a front person. It’s just drums, bass, guitar, keyboards and percussion. They’re stone cold pros, grizzled veterans of all the tours and all the studios. As individuals, they’re the players behind so many bands it’s difficult to list, but let’s start with Hiatus Kaiyote, The Bombay Royale, D.D Dumbo, Swooping Duck, The Meltdown and The Black Arm Band, not to mention their ongoing collaboration with Emma Donovan. When they come together, they’re one of the tightest, sharpest, most dynamic musical units ever to exist. The Putbacks don’t play that often, so don’t sleep on these shows. Support from Godtet (Godriguez) & The Sticks. We acknowledge and respect that this event is being held on the traditional lands of the Gadigal people. Sovereignty was never ceded.